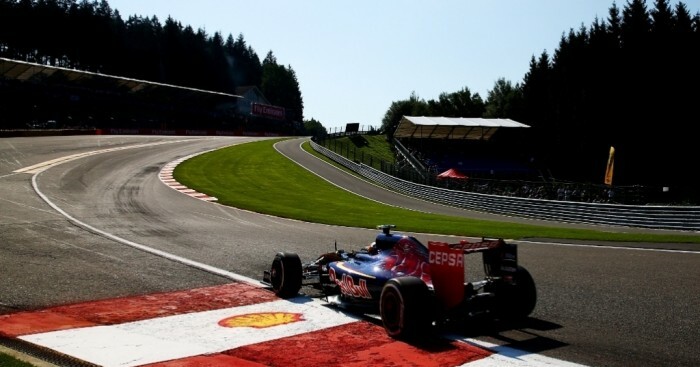 Carlos Sainz Jr: "It’s great to be back in the car and to do so at such an exciting track like Spa makes it an even better feeling. I enjoyed my first couple of laps in an F1 car for the first time here, it felt pretty special as this is the fastest I’ve ever driven around my favourite circuit! It was a positive day today. We know that it’s not going to be the easiest of race weekends for us as this track doesn’t suit our car very well, but we had a clean Friday. We managed to complete most of our run plan and, even though there were a bit too many red flags which means we are lacking a bit of information regarding the long run, I’m happy with today." Max Verstappen: "It was a good day today. I always enjoy driving at this great circuit and I’m happy to be back. Today it was my first time here at the wheel of an F1 car and it was a lot more challenging than with an F3 car. In general I’m happy with how the day went. Of course there’s still a few things to improve balance wise, but it was not bad at all. I slowly built my confidence up in FP1 and by the end of the session I was feeling great. In FP2 I didn’t manage to have a lot of free laps, but I’m happy with the behaviour of the car and I think our pace can keep on improving, so I’m looking forward to tomorrow." Valtteri Bottas: "It was nice to be back in the car after the break. Today our main focus was on aero testing, including the rear wing configuration and we also looked at the tyres as you would expect from a Friday. We collected plenty of data throughout the day so we know that today’s times are not too representative, and we will continue to strengthen our performance throughout the weekend." Felipe Massa: "It was a typical Friday for Williams, we don’t go out trying to top the time sheets. We completed a lot of the work we had set ourselves, only held back by the red flags which were unexpected. This has meant my long run pace isn’t as clear as I would have hoped, but we should be able to be competitive tomorrow and build as the weekend progresses." Jenson Button: "We’re running a new engine this weekend, and it’s definitely an improvement – but you never really know how much until you go through all the data, which is a lengthy task. Additionally, it’s always tricky here in terms of knowing what downforce level to run. I think we’re running too much downforce, and we’ll need to look at that and put it right for tomorrow. Nonetheless, the car got a lot better through the day. This afternoon was much better – the balance is still a little difficult when we’re on high fuel, but, on low fuel, the car feels reasonably good. Obviously, we’re not fully competitive around here, but the feeling with the car isn’t too bad." Fernando Alonso: "It’s hard to make direct comparisons between the two engine specs – you’d need to compare both engines on the same day, and that’s impossible. Furthermore, the characteristics of the circuit – both here and Monza – are the opposite of what our car likes, which makes comparisons harder. But the dyno and the data tell us there’s more power, so we’ll keep going and improve the car as much as we can. We knew ahead of the weekend that we’d be starting from the last row, so it’ll be interesting if the weather changes and we have a crazy race on Sunday. Whatever happens, I will try to learn as much as possible." Will Stevens: "Despite a nice relaxing break, you can’t underestimate the lure of racing and it was fantastic to be back in the cockpit today. I always enjoy it here, it’s such a mighty circuit, and as we’ve seen today with other teams, not an easy one to master. Nonetheless, I think we have done a good job here today on the opening day of running and it bodes well for the rest of the weekend." Roberto Merhi: "Overall, a good day for me and the team, at a circuit that is a bit of a favourite for me. The red flags made it difficult to maintain our rhythm, but we completed the programme and I think it is a good start to the weekend ahead. We have a few new things with the car; small developments but ones designed to help increase our confidence to push the car. It’s nice to be back in the close fight with my team-mate again and I hope we can continue to push each other like this for the rest of the season."